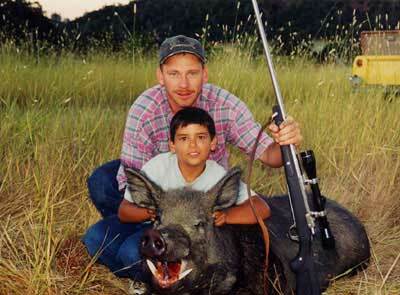 This 340-pound boar was taken on the Burrows Ranch on June 19, 2000 by Dennis Yaws of Oregon. Pictured with Dennis is the assistant guide, Tyler Burrows, grandson of Bill Burrows, ranch owner. It took two 7mm slugs to bring down this hog. The Burrows Ranch is located west of Red Bluff, California. If you are interested in hunting the Burrows Ranch, contact Bill Burrows at (530) 529-1535.